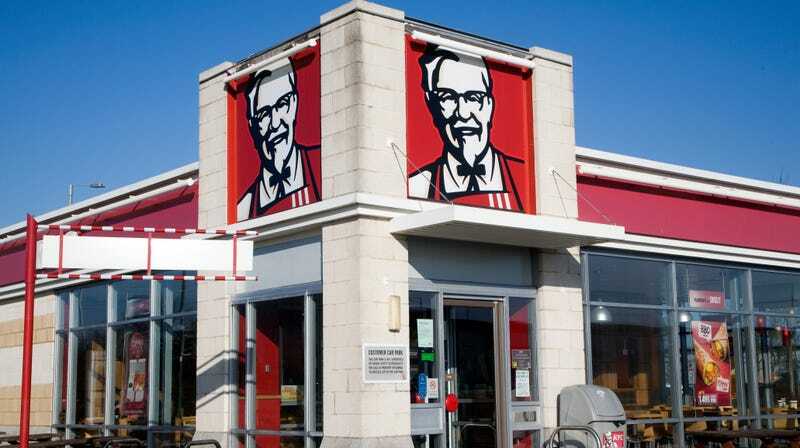 A KFC branch in Suffolk, England. We reported earlier on KFC’s goals to have healthier menu options available in Britain by 2020, with a decrease of 20 percent in average meal calorie counts by 2025. Some of the options bandied about included sugar-free-only drinks, healthier sides, and vegetarian options. There, we were stumped: vegetarian options? Like cole slaw? As it turns out, KFC U.K. (an acronym thisclose to swearing) is crafting a vegetarian version of its signature item. The New York Times reports that KFC “was testing chicken-like ‘vegetarian options’ in Britain with its signature blend of herbs and spices. ‘Development of the recipe is still in its very early stages, and so the options we’re exploring in our kitchen are still top secret,’ a spokesman for KFC said in a statement.” Yeah, yeah, just like those herbs and spices. Once the recipe is perfected, it will be rolled out to test markets, with the goal for a 2019 launch. Here, my brain splits into two places. I’ve enjoyed the occasional MorningStar Farms chicken patty, especially in my veggie days. It even seemed superior to the MorningStar fake burger. And the current success of White Castle’s Impossible Slider bodes well for a veggie chicken market. On the other hand: Veggie fried chicken? Ewwwww. And how healthy can something deep-fried—even a vegetarian version of chicken—actually be? And are vegetarians likely to flock—sorry—to KFC in the first place? At any rate, maybe this veggie option will help the U.K. avoid previous nightmare scenarios like its recent KFC chicken shortage.